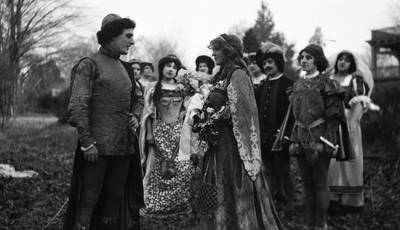 A Thanhouser costume drama, possibly “King Rene’s Daughter” [working title “Iolanthe”], released July 1, 1913. From Henrik Heri's Danish poetic drama; the cast included Maude Fealy (Iolanthe, the blind girl), Harry Benham (Tristan, Count de Vaudemont), Mignon Anderson, David H. Thompson (Ebu Jahia, the Moorish physician), William Russell (Pierre, captain of the guards), Leland Benham, Mrs. Lawrence Marston (the nurse), Robert Broderick (King René). BW film negative; 3.25" x 5.5"